Notes from the LeftEast editors: this piece was first published in the Hungarian journal Mezosfera, and was reprinted with kind permission of the author and the journal. It should be cited as: Zoltán Ginelli, “Hungarian Experts in Nkrumah’s Ghana. Decolonization and Semiperipheral Postcoloniality in Socialist Hungary,” Mezosfera Issue No 5, Refractions of Socialist Solidarity, ed. Eszter Szakács (Budapest: tranzit. hu, 2018), http://mezosfera.org/hungarian-experts-in-nkrumahs-ghana/. How was Hungary connected to post-WWII decolonization? What does this episode of Eastern European history tell us about shared postcolonialities, transnational interconnectivity, and semiperipheral positioning strategies? This study aims to address these questions in the context of socialist Hungary’s evolving relations with independent Ghana under the Kwame Nkrumah regime (1957–1966), by focusing on the role of Hungarian experts in a transnational context. My aim is to show how this encounter led to the professionalization and internationalization of Hungarian postcolonial knowledge production, and how parallels in colonial history were drawn between Hungary and Africa. I interpret various cases by introducing the notion of semiperipheral (post)coloniality, which connects insights from postcolonialism and world-systems analysis to show the intertwined discursive and structural processes of semiperipheral relations affecting colonial discourse in the activities of experts. 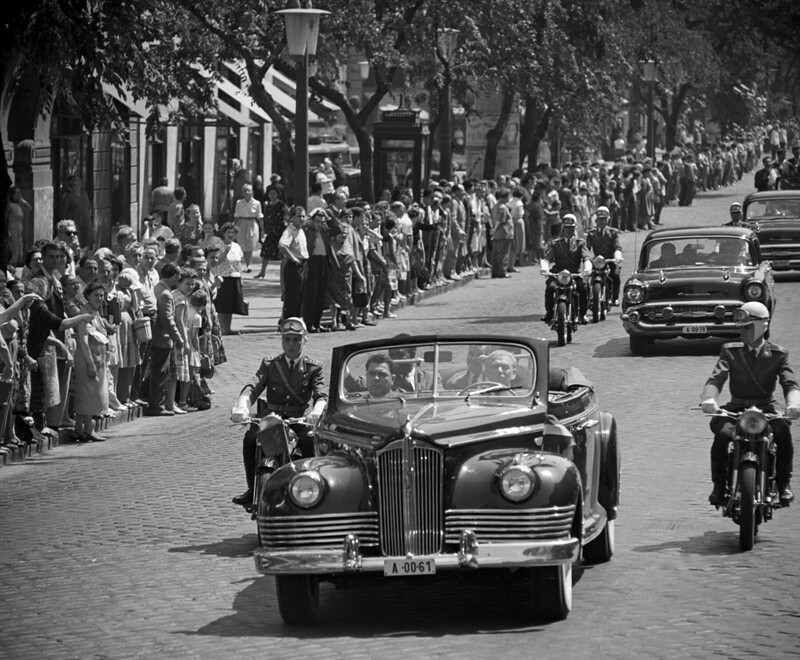 Ghanaian president Kwame Nkrumah in Budapest, 28 July 1961. MTI Photo: Jenő Pap. © MTVA. Global and transnational history aims to decenter the European episteme by deconstructing internalist Eurocentric histories. The Cold War evolution of European integration was not only induced by geopolitical pressures from the Socialist Bloc, but also strongly embedded in post-WWII colonial struggles during the global 1950s.1 Since “decolonization” was a British concept of top-down “granted” independence in the vision of building a Commonwealth from colonies, socialist countries refrained from using the term and defined themselves as fighting against imperialism and colonialism. Although this anti-imperialist solidarity towards emerging Afro-Asian postcolonies forged an important political project against the dominant capitalist system, it emerged during the global economic boom and relative geopolitical openness of the 1960s détente era. Decolonization also expressed the hegemonic shift from “high imperialism” to developmentalist imperialism, the opening up of investments predominantly for expansive US capital, which also resulted in rivalry with the USSR for the modernization projects of newly independent postcolonial states. In the historical long-term (longue durée), Hungary occupied a relatively stable semiperipheral position between the global center and periphery in the hierarchical division of labor of the capitalist world-system.2The semiperiphery concept bridges cultural and structural aspects, and offers a geographically more refined framework than colonizer/colonized subalternity, center/periphery dependency, or capitalist/socialist Cold War dichotomies. While colonialism expresses the power relation between the global center and the periphery, the semiperiphery stands out from the dominant historiography of colonialism due to its complex, in-between, uneasy and ambivalent relation to coloniality. Semiperipheral (post)coloniality expresses the ambivalent historical relations of being both colonized and colonizer, and conceptualizes how the intertwined long-term ideological and structural positions as effects of global integration (re)produce both colonial relations and colonial discourse.3 Semiperipherality shares both central and peripheral aspects: being strongly connected through its cultural or geographical proximity to the global center, but remaining peripheral, dependent and subjugated to the global core as its “internal other;” not having colonies, but benefiting from civilizational superiority and imperialist practices over the global periphery; developing a strong urge to catch up with and imitate the center, while sharing its civilizational and modernization mission towards the periphery. Politically, the semiperiphery offers the double role of revolutionary resistance against the hegemonic center through its proximity, bridge function and alliance with the periphery as well as being the comprador “evil servant” against the periphery by stabilizing the exploitative hierarchy of the hegemon-led world system. The People’s Republic of Hungary is also guided by the aim to support the war for independence of colonial peoples, strengthen friendship between different peoples, and contribute to securing world peace. Our people turn with great curiosity towards Africa, where today there is a battle decisive to the future of mankind wielded between social progress and the forces of imperialism. We, in Africa, fight consistently. Whatever direction we try to leap forward, everywhere we find ourselves confronted by imperialist treachery. We will master our difficulties with the support of the socialist camp. We are here to strengthen our relations with Hungary, and strengthen our ties with the countries of the socialist camp. The meeting of János Kádár and Kwame Nkrumah in Balatonaliga. Kalmár György, Arany Ghana (Budapest, Kossuth Könyvkiadó, 1964). 289. 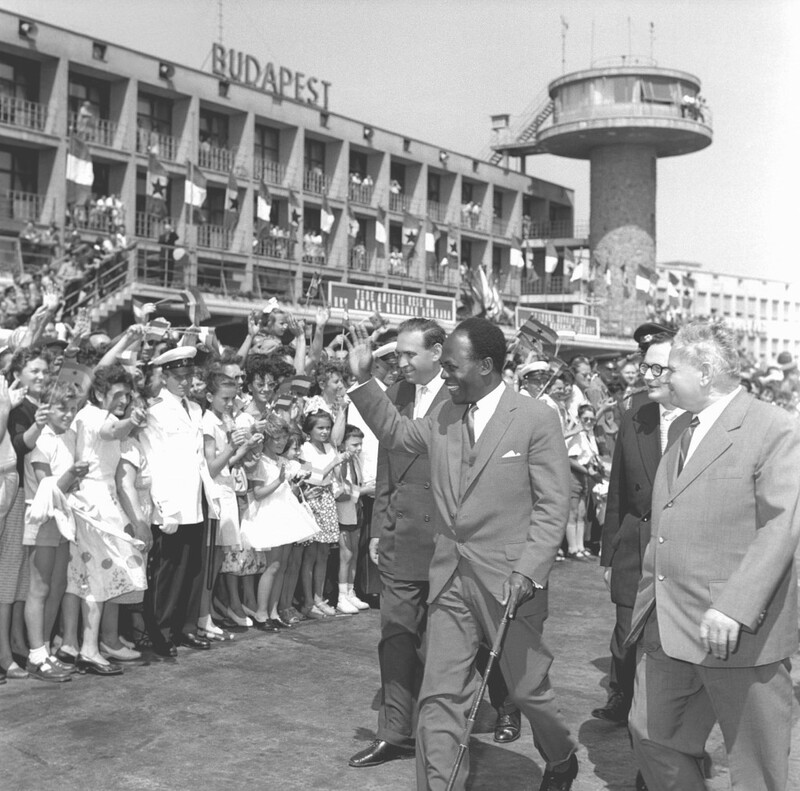 Ghanaian president Kwame Nkrumah in Budapest, 28 July 1961. MTI Photo: Gábor Pálfai. © MTVA. During his Hungarian visit, Nkrumah read a small book, Planned Economy in Hungary, published by József Bognár in 1959.24 Bognár was an important expert in socialist Hungary: previously he was mayor of Budapest (1947–1949), a prime member of the Small-Holders’ Party (1943–1948), and minister of domestic and foreign trade in the communist government (1949–1956), but after the 1956 revolution he rejected invitations to the ministry. He instead became professor at Karl Marx Economic University from 1956 and president of the Institute of Cultural Relations (1961–1969), but remained a major (yet very much underrated) figure in Hungarian foreign policy-making and in preparing the semi-capitalistic reforms of the New Economic Mechanism. 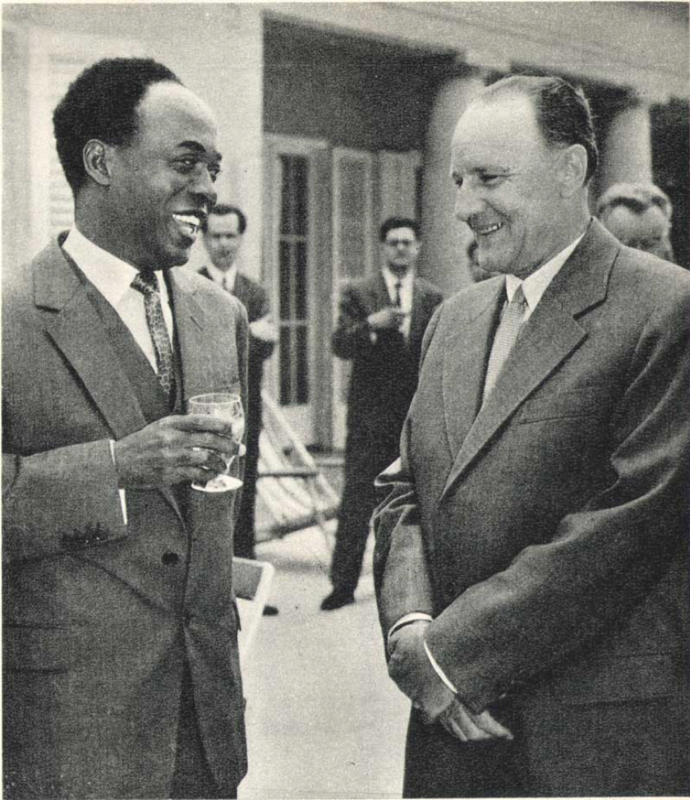 Nkrumah was impressed by Hungarian achievements and decided to invite Bognár to become chief advisor to Ghana’s First Seven-Year Plan. Bognár recruited his team and spent with his two assistants, Tamás Bácskai and Gábor Székely, two months from January until the end of March 1962 in Accra. The Hungarian delegation of development economists arrive in Accra in January 1962 to work on Ghana’s First Seven-Year Plan. 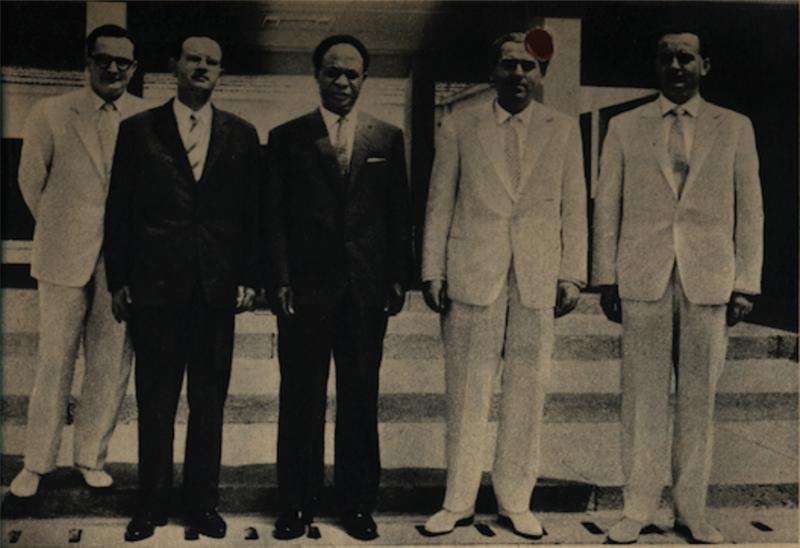 From left to right: Tamás Bácskai (Bognár’s assistant, associate professor), Péter Kós (first ambassador), Kwame Nkrumah (President of the Republic of Ghana), József Bognár (chief advisor), Gábor Székely (Bognár’s assistant, economic engineer). József Bognár, “Két hónap Ghánában,” Magyar Hírek (May 1, 1962): 1–2. 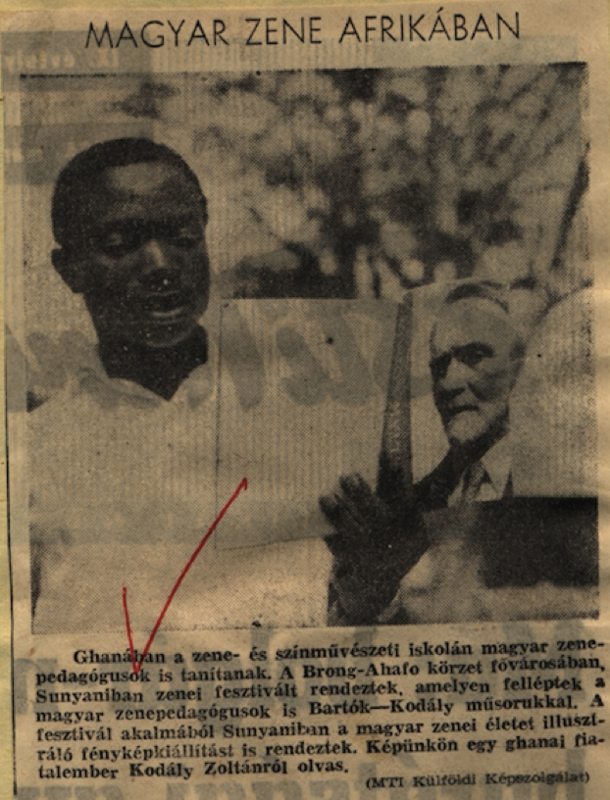 Bognár’s assignment in Ghana was also decisive in founding the Afro-Asian Research Group in 1963, first based at Karl Marx Economic University at his Department of International Trade and the Department of Economic History,33 which later evolved into the Center for Afro-Asian Research (CAAR) at the Hungarian Academy of Sciences (HAS) in 1965. The establishment of CAAR went in line with the institutionalization of similar centers in socialist countries that specialized in global comparative analysis and development economics, including the Institute for the World Economy and International Relations in the Soviet Union in 1956, the Center of Research on Underdeveloped Economies in Poland in 1961, and the Institute for Developing Countries in Zagreb, Yugoslavia in 1971. Perhaps the earliest and most prominent group of development planners in the Eastern Bloc consisted of Polish economists Michał Kalecki (1899–1970), Ignacy Sachs (1927–), Oskar Lange (1904–1965), and Czesław Bobrowski (1904–1996), also joined by Kazimierz Łaski (1921–2015) and economic historian Witold Kula (1916–1988). Compared to CAAR, at the time of the Ghana assignment the Polish already had a trained and more homogeneous staff of economists who drew on their pre-WWII experiences to deal with development planning in “developing countries.”34 Although the Polish are relatively well known, most of these Eastern European experts are rather underrated in mainstream literature despite their contemporary international prominence—as Bognár’s figure definitely demonstrates. A few examples of noteworthy intellectuals demonstrate the significance of 1960s Ghana as a convoluted site of capitalist and socialist modernization trajectories, and “third way” development alternatives. At an old age, William E. B. Du Bois went to Ghana in 1961 as a special guest of President Nkrumah to direct the government-sponsored Encyclopedia Africana, and in turn renounced his US citizenship to become a citizen of Ghana, where he finally passed away in 1963. In 1959, the postcolonial writer Frantz Fanon became the first Algerian ambassador in Ghana for the Algerian National Liberation Front, and his critique against postcolonial nationalist essentialism was partly based on his experiences under the Nkrumah regime.44 In 1960, André Gunder Frank came to Ghana to decide whether he would focus on African cases to develop his dependency theory, but he instead chose Latin America for cultural reasons.45 As a former Africanist, the world-systems theorist Immanuel Wallerstein also drew many of his ideas from his early involvement in African studies based in Ghana from the mid-1950s to the early 1960s (first funded by the Rockefeller Foundation in 1956), and even his Ph.D. was about Ghana’s independence.46 Many experts still arrived from the former colonizer, the UK, but West Africa also emerged as an important region for the US “takeover” of postcolonial planning expertise in the spirit of modernization theory already from the 1950s. 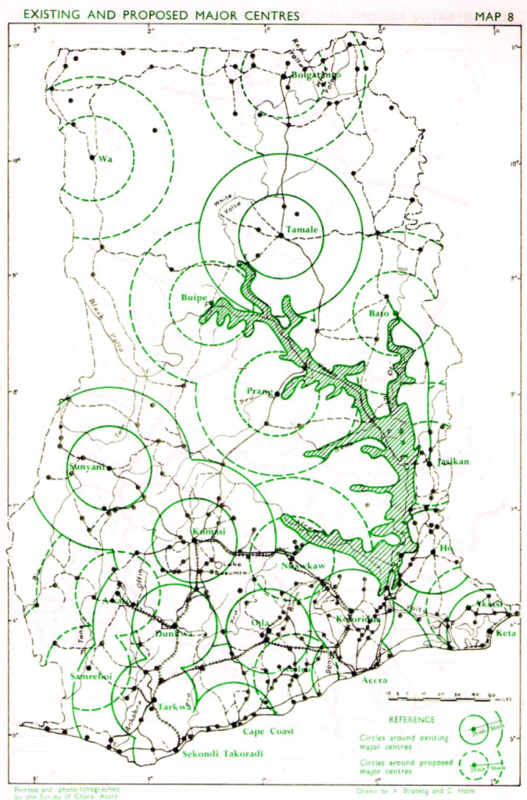 The Ford and Rockefeller Foundations, the Marshall and Rhodes Scholar programs, and USAID (from 1961) persuaded and recruited both Americans and African researchers to work on local urban and regional planning using Western theories and technology.47 “Quantitative geographers” from the US, such as Brian Berry and Michael McNulty did research on Ghana, while Peter R. Gould (his research in Ghana was also funded by Rockefeller Foundation in 1958–59), Edward Taaffe and Richard L. Morrill constructed their much cited and debated ideal stage model of transportation system development partly based on their Ghanaian experiences.48 Due to the postcolonial emergence of Indian regional planning in the 1950s, planners also arrived from the Indian Institute of Technology in Kharagpur (founded in 1951). To this important but only selective line of intellectuals one can add the various Eastern European experts coming from the Soviet Union, Yugoslavia, Bulgaria, Czechoslovakia, Romania, Poland, the GDR, and Hungary. In Hungary, individual contracts with experts were made possible by the establishment of the International Organization of Technical and Scientific Assistance (TESCO) in 1962. Organizing expos and participating in international trade fairs were crucial in establishing foreign economic ties and building local markets for Hungarian goods, while the Hungarian government exported technology and key-turn factories of machinery, electric equipment, and pharmaceutics, all of which required the expertise and mediatory role of diplomats, traders, managers, scientists, engineers, and educators. While the literature on transnational development economists and architects have increasingly developed in the past decade, there seems to be a marked silence on the activities of these other Eastern Bloc experts, adding to this list natural scientists, such as geologists, biologists, geographers, chemists, doctors etc. working in “Third World” contexts.49 For example, Soviet geologists in Ghana were already prospecting minerals, such as coal, oil, and bauxite in the late 1950s. But while Soviets (and Chinese) had to flee immediately after the US-backed 1966 coup against Nkrumah, socialist Eastern Europeans (except the GDR) were trusted enough to be allowed to stay intact and continue their activities—a good indication of semiperipheral postcoloniality. The carrying out of the First Seven-Year Plan and the VRP required serious on-the-spot prospecting, engineering, and spatial planning, much of which was carried out by Eastern Europeans based at the University of Ghana in Legon (near Accra) and the University of Science and Technology in Kumasi. One of the planners was the Hungarian architect László Huszár (1932–2002). Huszár fled to London due to his participation in the 1956 revolution, and after an unsuccessful attempt to build a political base of diaspora intellectuals, he left to Ghana with British architect David Grove to work between 1961 and 1965 on planning new settlements for the relocated population. They published on planning the service centers of Ghanaian settlements and developing planning regions in their book The Towns of Ghana (1964), which was widely cited and debated, and formed an important element in the postcolonial history of urban and regional planning, a topic yet missing from mainstream human geography.58 This assignment had a huge impact on the life and career of Huszár, who afterwards specialized in “Third World” urban and regional planning (he considered himself a “regional planner”), and worked in Malaysia, Thailand, Cameroon, Iraq, Saudi Arabia, Sri Lanka, Indonesia, and Brunei. Although Huszár came not from socialist Hungary but capitalist United Kingdom, through transnational networks he could re-embed himself into Hungarian expert communities, from which David Grove also profited in his later career. Existing and proposed central places (settlements) in the Volta River Resettlement Plan designed by László Huszár and David Grove. Huszár and Grove, 72. 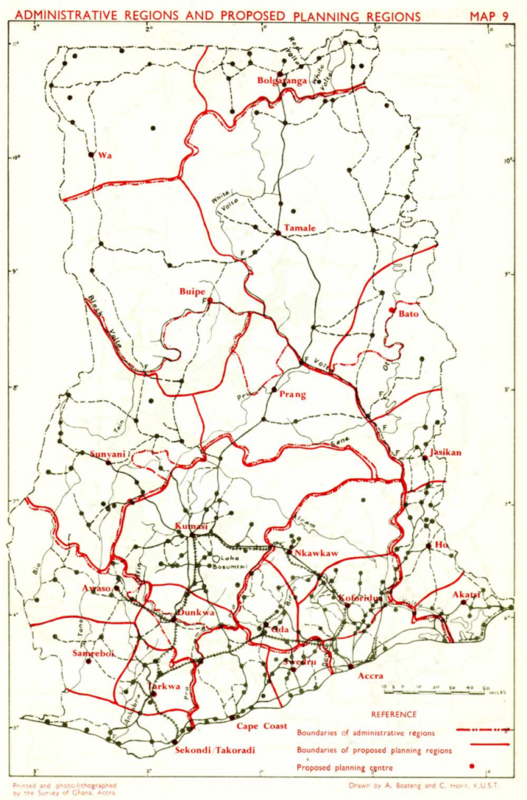 Proposed planning regions according to existing administrative regions and optimal service centers in the Volta River Resettlement Plan designed by László Huszár and David Grove. Huszár and Grove, 72. He worked with Hungarian and West African planners on various planning assignments in Nigeria up until 1976, leading further projects in Algiers and Ethiopia. Remarkably, Polónyi argued for his Hungarian competence in planning postcolonial projects by pointing out the comparable history of (East) Central Europe and Africa, since both shared the “colonial experience” of once being colonized— “such common features,” he argued, “can increase our ability to at least partially understand the feelings and thoughts of Africans.”68 In a lecture given in Darmstadt, Germany in 1978, he claimed that the planning practices in the Hapsburg “recolonization” of Hungary after Ottoman occupation could provide a model for developing countries.69 This expressed his “nostalgia” for imperial modernity’s efficient planning, whilst criticizing Soviet colonialism, just as in the Hungarian anti-Soviet dissident discourse that resurrected the cultural idea of “Central Europe” in the late 1970s. As the architectural historian Moravánszky shows, Polónyi made comparisons between the comb-like settlement structure developed by 18th century Austrian military engineers in Hungary, in his Ghanaian students’ projects in 1968, and his project for Újszeged, Hungary in 1978. Polónyi in fact developed unique but ambivalently positive notions of “elitism” and “colonialism.” First, he upheld the necessity of top-down planning schemes, as his work in the planning region of Lake Balaton in Hungary in 1958, against the vicissitudes of “populism” he experienced in Calabar, but supported “gradual transformation,” “popular initiatives,” planning with locals, and embedding cultural traditions in favor of creating an autonomous African modernism. Second, he argued that the successive colonial rule of the Roman Empire, “Pax Turcensis” and “Pax Austriatica” in the Carpathian Basin and the Balkans brought stability, since “they built up not only effective public administration, but also constructed roads, railways, towns, harbors, schools, and hospitals.” By drawing colonial parallels between Central European and African history, Polónyi suggested that less-developed countries can only modernize by pragmatically exploiting the gains of being connected to the center under foreign political rule: “colonialism—except when a socially and economically less developed power extended its control over a territory—can be interpreted as a challenge to close up to the centers,” or as in Moravánszky’s interpretation, the road to progress is “balancing between ‘closing up’ to the center and ‘remaining loyal’ to the periphery.”70 In this peculiar semiperipheral positioning strategy, Polónyi’s “exception” referred to Soviet colonialism in Europe, while Hungarians could help Africans’ adaptation to modern industrial civilization due to their ability to make rational use of their own imperialist heritage. The optimist preservationism of Róna was expressed by his call to “record the jungle!” [magnetofonnal a dzsungelbe!] and his cautious warning, “we must understand: the dark-skinned man is not uncultured.” Pártos sensitively shed tears when recalling their “philharmonic concert in the jungle,” drawing the exotic picture of Bartók’s modern music enjoyed by curious black youth.78 The humanist appreciation of the merits and authenticity of African culture went hand in hand with upholding the need to persuade and civilize the young African nation. 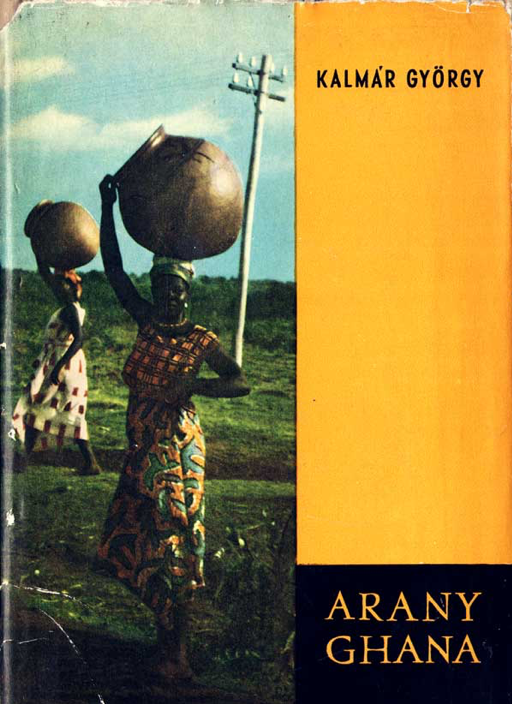 Hungarian music in Africa: A Ghanaian man reads Zoltán Kodály “Magyar zene Afrikában,” Esti Hírlap (10 March 1964). HU OSA 300-40-1: 848. Continuities in Eurocentric and colonial-imperialist attitudes were typically expressed in views of socialist modernizationism. Most press materials presented the newly built, modern architecture, and the media heavily relied on the contrasting image of tradition versus modernization in framing the Ghanaian experiment. For example, the economist Tamás Bácskai, a member of Bognár’s delegation in Accra, reported in the popular scientific magazine Life and Science [Élet és Tudomány] on his Ghanaian experiences in 1962. While signaling important economic achievements (e.g. the Volta dam), his strong modernizationist narrative highlighted inner cultural aspects such as traditionalism and tribalism as the greatest barriers to socio-economic development, individualism, and the nuclear family. He argued that due to these many diverging forces of traditionalism, only a uniform, modern central state could allow socio-economic progress. In other words, the unorganized “natives” needed control, only now coming not from colonial administration, but from the socialist state. 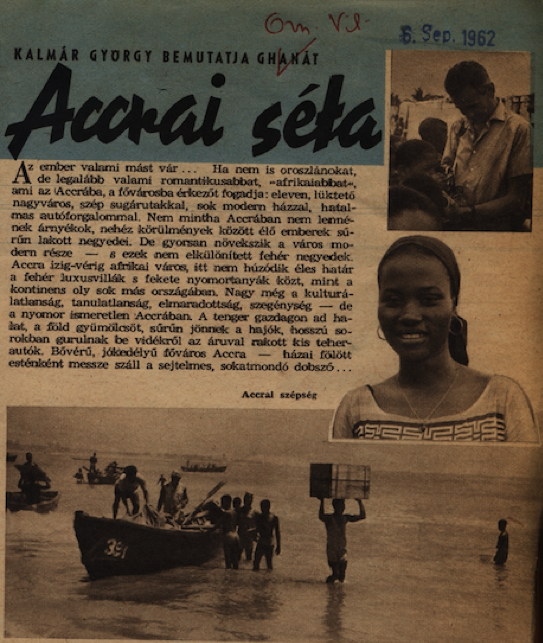 “A walk in Accra” article by György Kalmár. Kalmár György (1962): Kalmár György bemutatja Ghanát. Accrai séta. Ország-Világ, szeptember 6. HU OSA 300-40-1: 848. Eastern Bloc countries attained a key position in decolonization during the Cold War, and were important producers of postcolonial knowledge. Connecting to recent literature, I argue that this encounter should be understood in a global historical perspective as a significant episode in the long-term history of Hungarian semiperipheral (post)coloniality.84 Hungary’s historically stable in-between or semiperipheral position between the center and periphery in the global hierarchical divisions of labor entailed an ambivalent relation towards Afro-Asian decolonization. Having a historical record of being both colonized and part of the imperialist core, while being locked in the Cold War double dependency of “East” and “West,” Hungary’s anti-imperialist political solidarity and shared historical positions with the postcolonial periphery were mixed with civilizational paternalism and pragmatic maneuvering in foreign policy. Despite the vivid relationship with Ghana in the 1960s, socialist Hungary never developed deep relations with the Non-Aligned Movement.85While Hungary was eager to open towards Afro-Asian countries to break international isolation and gather allies in the UN, being economically closely tied to Comecon and the West limited its actual trade possibilities and sharpened the importance of technical assistance and education, thereby increasing the role of experts in the postcolonial world. Semiperipheral postcoloniality underlines that despite the coincidental emergence of individual cases described in this study (even Bognár explained his assignment by mere “luck”), and the unique merits of career trajectories and professional successes, structural relations not only conditioned the positional identifications of experts, but also set out their possibilities of emergence in a wave of East-West rapprochement and internationalization, global economic boom, and geopolitical détente in a period of post-WWII hegemonic shift and capital expansion towards the global periphery. Although embedded in the wider thrust of “socialist globalization” and the geopolitical interests of Moscow, Eastern European experts were nevertheless far from being simply the “foot soldiers” or “messiahs” of socialist modernization and propaganda, as chanted by Western Cold War propaganda. While the political loyalty of experts was considered as a prerequisite for export contracts, the pragmatism of foreign policy often overruled this in favor of their language skills and professional experience. In addition, socialist internationalism was pragmatically exploited by individual national interests. After the brief but painful post-WWII geopolitical restructuration and consequent Sovietization, Eastern Bloc nations eagerly tried to benefit from both socialist internationalism and their own histories of coloniality and underdevelopment to gain foothold in the “Third World” and counter or compete with Western dominance. Second, Afro-Asian decolonization and Cold War geopolitical pressures created opportunities in postcolonial development planning and provoked Hungarian intellectuals and experts to embark on the epistemological project of thinking in comparable terms with the postcolonial periphery. This episode forms an important political moment and knowledge niche for us to rethink shared colonial histories, peripheral relations, structural dependencies, political solidarity, and strategies of joint resistance in the capitalist world-system between Eastern Europe and other postcolonial regions, against often Eurocentric cultural differences and civilizational distinctions. Third, semiperipheral postcoloniality also puts into question the dominantly social constructionist arguments of postcolonial theory. Poststructuralist notions such as “othering”, Orientalism, subalternity, or hybridity, however complex and theoretically refined, or relationally well re-applied in the Eastern European context (see for example, Milica Bakić-Hayden’s “nested Orientalism,” or Maria Todorova’s “Balkanism”), were developed inside a dichotomous center-periphery or Orientalist-Occidentalist framework, which ironically reproduces a West-centric epistemology and misses or simplifies the complex, layered, and ambivalent colonial experiences of Eastern Europe and Hungary.96 Meanwhile, recent historical accounts about Eastern Bloc and “Third World” relations mostly focus on the diplomatic, geopolitical, trade, and economic aspects of foreign policy, and these are seldom conceptualized holistically with cultural, ethnographic, identity, and development discourse. Semiperipheral (post)coloniality offers a more refined approach against existing postcolonial approaches in at least two ways. First, by conceptualizing “middling” or “in-between” semiperipheral positions, which produce an ambivalent mixture of subalternity and superiority. Second, by situating the seemingly fluid and relational discursive constructions of coloniality in a global historical and structuralist explanatory framework, which links discursive formations to specific modes of political economic integration into the world-system. I would like to acknowledge support from the Visegrad Fund research scholarship, which allowed me to conduct 2 months of archival research at the Vera and Donald Blinken Open Society Archives (OSA). The present study evolved from a 48-page research report submitted to the OSA, entitled Opening the Semi-Periphery: Hungary and Decolonisation(http://www.osaarchivum.org/files/fellowships/visegrad/reports/2017/GINELLI-201704.pdf). My gratitude also goes to professor James Mark for involving me in the five-year Leverhulme Trust-funded research project, 1989 after 1989: Rethinking the Fall of State Socialism in Global Perspective(http://1989after1989.exeter.ac.uk). Zoltán Ginelli is a critical geographer and historian of science from Eötvös Loránd University, Budapest. He is an assistant researcher at the Institute for Regional Studies of the Hungarian Academy of Sciences, and an assistant for the Leverhulme Trust-funded research project 1989 After 1989: Rethinking the Fall of State Socialism in Global Perspective based at Exeter University (2014–2018). His research focuses on the historical geographies of scientific knowledge, transnational and global history, world-systems analysis, and postcolonial and decolonial theory. His dissertation studies the transnational history of the “quantitative revolution” in Cold War geography and spatial planning. His main work is on the history of Hungarian geography, and his current research focuses on socialist globalization and the changing relations between Eastern Europe and the “Third World,” specifically Hungary and Africa. See Szilárd Biernaczky, “Afrikai tanulmányok magyarföldön?! 150 éve vajúdik országunk egy tudományterület létrehozásával,” Magyar Tudomány, no. 12. (2014): 1410–1423; Veszprém Megyei Életrajzi Lexikon.